Below: A nice nickel plated P-2 with a longer P-1 handle. The blade is also longer than usual measuring a full seven inches. It was in a later period sheath which split down both sides for some reason. This a very nice knife with a fully tapering blade unlike some of the fatter blades found on later P-2. It now resides in a lovely nickel plated Parkinson sheath. 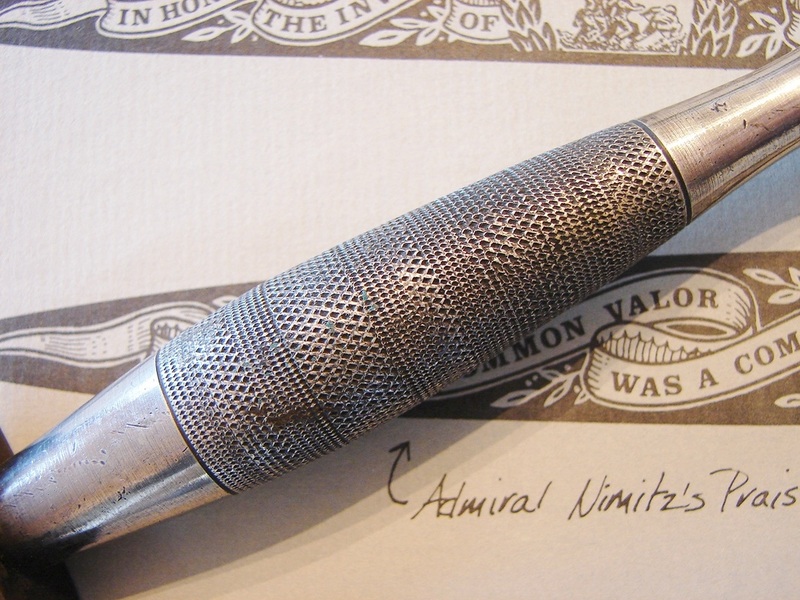 Below: A beautiful nickel plated second pattern with an unusual blade etched for the AAC, Army Air Corp. The blade is very slender and beautifully ground. The handle is stamped ^ 60. The maker is uncertain, perhaps Rodgers. The sheath has been modified to include a nickel plated or silver throat and the removal of the traditional frog and sew tabs. The hilt shows heavy wear and loss of plating on the pommel while the blade is pristine. A lovely knife for sure. Many collectors refer, incorrectly, to all nickle plated second pattern knives as "officer's models." There is no basis for assigning that title to them. They are among the earliest of the P-2 knives and used up remaining P-1 handles. This does not mean that there were no nickle plated ones made at a later date, as this was still an option. Shown below is a selection of P-2 with nickle plated handles. The second from the left is a Wilkinson Sword Co. model with the etched logos and an exceptionally long and tapered blade. It came housed in an unusual sheath that was perfectly fitted to the blade and had a stout retaining strap not the usual flimsy elastic one. Here is a "spray" of nickel plated second patterns of different blade lengths, assorted top nuts, and in varying condition. You will note that the center knife has had its tip broken off and been re-pointed at some time. All too often we find this. The knife on the far left was damaged by some idiot filing in a few serrations to one side of the blade near the guard. The knife on the far right has the marks of some sort of electric sharpening device down both edges of the blade. It is amazing how some people lack any sense of reverence for history, or for weapons of a bygone era. Perhaps I should say they just lack common sense, period. 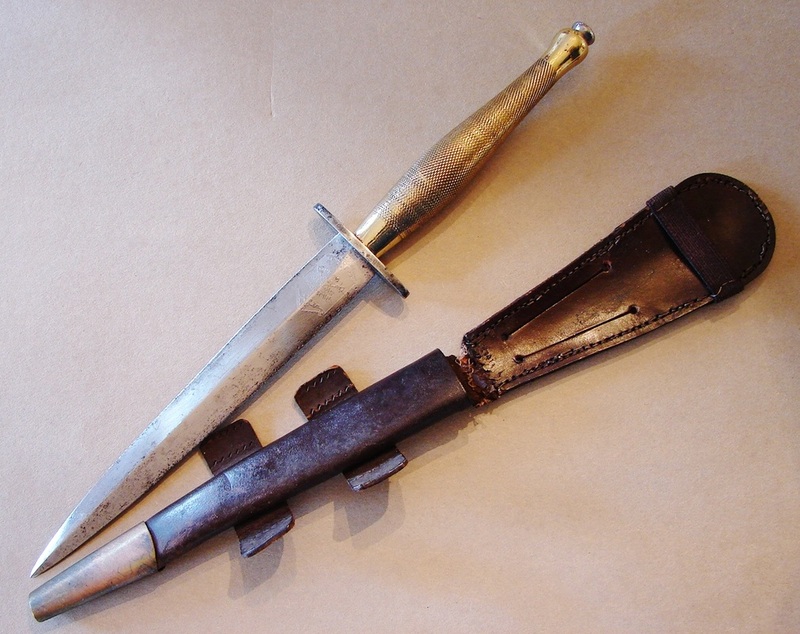 Shown below is the sole Wilkinson Sword model in my collection with its custom made sheath. The sheath is made of heavy leather with an American style snap. A close-up of the sheath is illustrated in that section especially set aside for miscellany including sheaths. Illustrated below is the Wilkinson logo faintly etched in this blade. This knife also has a unique sheath. In this photo the sheath's frog is folded double and laced in place by a leather thong. The frog is actually twice as long as the photo indicates and it has belt slots in the top. 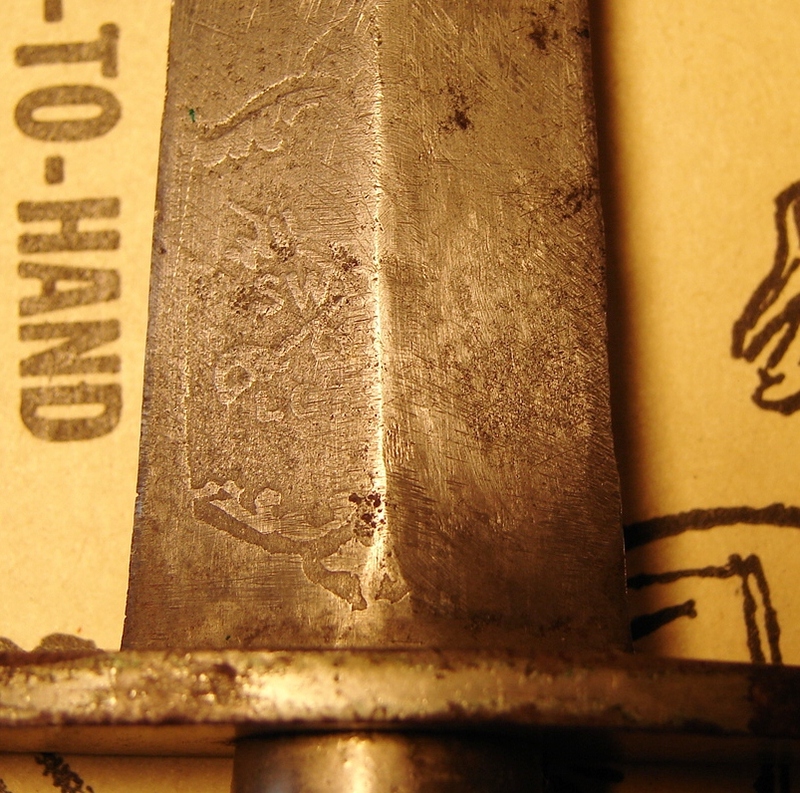 The guard on this knife is deeply engraved with the owner's initials, N.G.K. SILVER PLATED: The following knife has a silver plated handle and originally it had a lovely heat blued blade. Much of the bluing is gone and the tip was broken and reshaped at some time in the past. The handle is also notable for the defined ends of the checkering which is also unique. 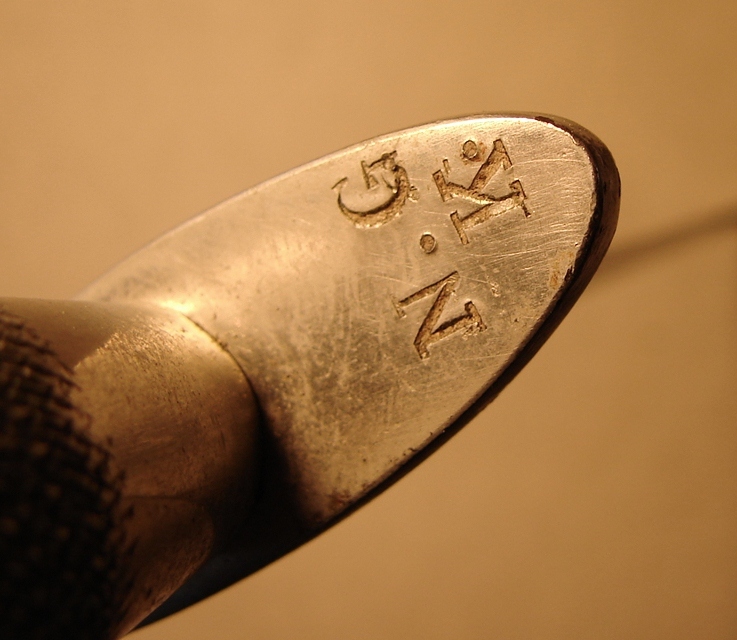 This style of checkering is referred to as "reverse checkering." There are no markings on the knife at all indicating it was most likely a private purchase item. There is a distinct similarity to this blade and those on the Beaded and Ribbed knives, including the failure rate. Could be they were made by the same company. Shown on the left is a close-up of the handle so that you can see the difference from a standard P-2. The handle is also a little more slender with a smaller knob at the pommel. Undoubtedly, when new, this was a very beautiful knife. The reverse checkering is pretty but not likely to provide as good a gripping surface as the early P-1 and P-2 knives, or the coarse checkering on the Fatman models. 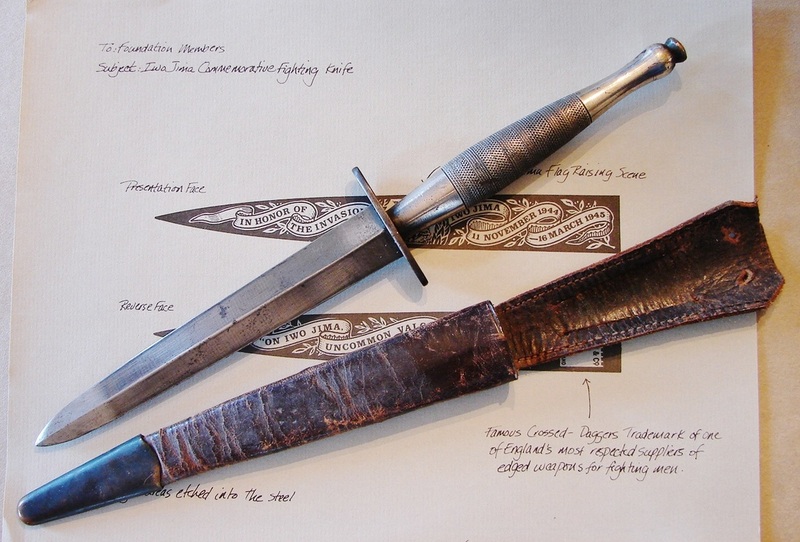 Based on the details, it is very likely this knife was made by J. Clarke & Sons in Sheffield. 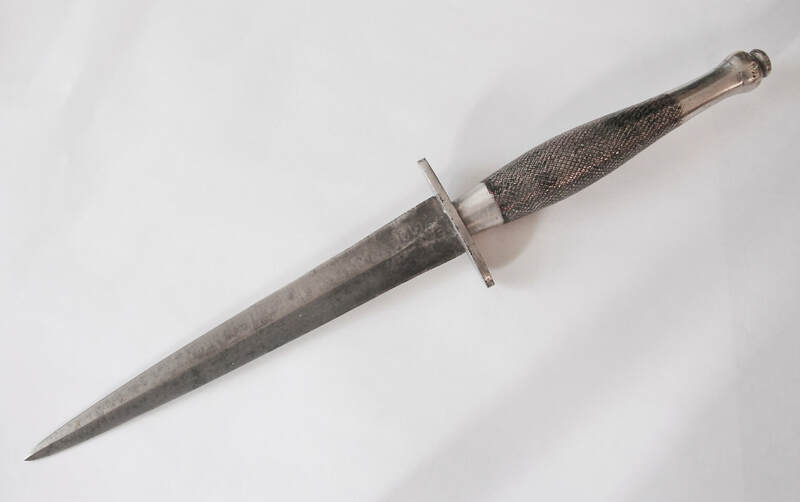 We have acquired another copy of this knife which is identical even down to the broken and re-tipped blade. Either there were two unfortunate individuals who broke their knives or the heat treat left the blades too brittle. GOLD PLATED: The knife illustrated below is a fine Wilkinson Sword Co. Second Pattern. At some time in its life the handle was given a gold wash or flashing. I am not sure of the process used or whether it was applied when it was new or later in its life. I do know, based on the top nut, that the knife has not been taken apart. The gold remains very bright after all of these years. You will note that the top nut and the guard are un-plated steel. The frog has nearly separated from the body of the sheath something not uncommon with these sheaths. A close look at the pommel region will also reveal the mold offset visible in the casting. The full length blade has an almost frosted surface appearance.